The presence of parasites in fish is very common, but most of them are of little concern with regard to economics or public health. Reviews have been published by Higashi (1985), Olson (1987) and Cross (2001) and recently a scientific status summary was prepared by Orlandi et al., (2002). More than 50 species of helminth parasites from fish and shellfish are known to cause diseases in man. Most are rare and involve only slight to moderate injury but some pose serious potential health risks. The most important are listed in Table 5.19. Table 5.19 Pathogenic parasites transmitted by seafood. All the parasitic helminths have complicated life cycles. They do not spread directly from fish to fish but must pass through a number of intermediate hosts in their development. Very often sea-snails or crustaceans are involved as first intermediate host and marine fish as second intermediate host, while the sexually mature parasite is found in mammals as the final host. In between these hosts, one or more free living stages may occur. Infection of humans may be part of this life cycle or it may be a side track causing disruption of the life cycle as shown in Figure 5.9. In most cases, infections of man are acquired by eating intermediate hosts that are raw or incompletely cooked, partially pickled or smoked or poorly preserved. The infections are preventable if the food is prepared sufficiently to destroy the infective stages of the parasite. However, it is extremely difficult to change cultural and eating habits, and therefore these parasites will continue to prevail. Anisakiasis is a gastrointestinal parasitosis caused by the larval stages of anisakid nematodes. Humans acquire the disease by eating raw or improperly cooked or preserved seafood. Surviving worms will then penetrate the gut wall and enter the peritoneal cavity. Symptoms are often non-specific with abdominal pain, nausea and vomiting. Vague abdominal pain and possibly fewer may persist for weeks. Anisakiasis is common in Europe (the Netherlands), Japan and the US. 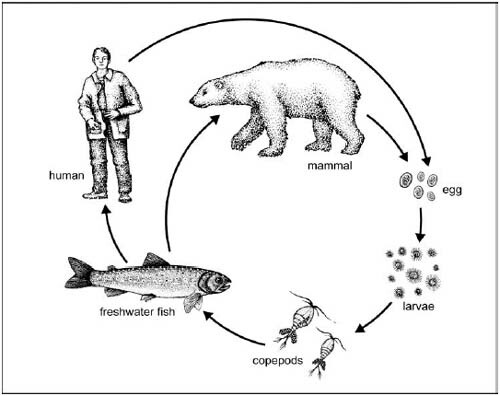 The complete life cycle of Anisakis species is shown in Figure 5.9. Humans become infected by eating fish containing life third stage larvae. However, humans are accidental hosts, since transfer of parasites to humans cannot result in a complete life cycle for the parasite. Figure 5.9. 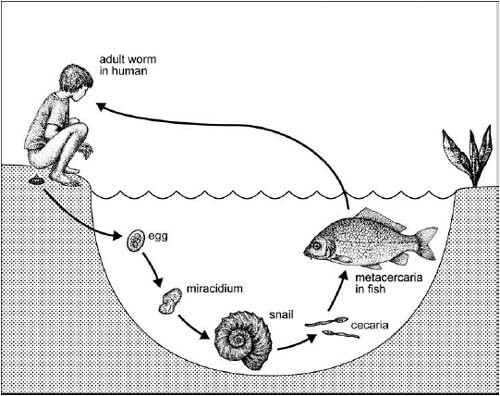 Life-cycle of Anisakis species. The species of anisakidae most often associated with disease are Anisakis simplex (the herring worm) and Pseudoterranova dicipiens (the cod worm). The infective larval stage of the parasites can be found in the viscera and in the musculature of a variety of fish (see Figure 5.10). It is easy to distinguish between the two species as seen in Table 5.20. Table 5.20 Characteristics of Anisakis species. Figure 5.10 Anisakis simplex (left) and Pseudoterranova dicipiens (right) both in cod (photos courtesy of Dr. Stig Mellergaard). Anisakis spp. are widely distributed geographically as well as within numerous fish hosts (cod, herring, squid, salmon a.o.). Thus prevalence reached more than 75% in fresh US commercial salmon (Deardoff and Overstreet, 1991) and nearly 100% in herring from the North Sea (Roepstorff et al., 1993). In areas with no presence of sea-mammals, the prevalence of Anisakis will naturally also be very low. It should also be noted, that the parasite has never been detected in a large number of aquaculture salmon examined as shown in Table 5.21 (Angot and Brasseur, 1993; Deardoff and Kent, 1989; Bristow and Berland, 1991). Table 5.21. Prevalence of Anisakis simplex in reared and wild caught marine fish species (after ICMSF,2003). Low or high temperatures or high salt concentrations may be used to kill or inactivate nematodes in fish (Table 5.22). In contrast, acid conditions are not affecting the nematodes. In the EU, conditions concerning control of parasites are laid down in Council Directive no. 91/493/EEC (EC, 1991a). All fish and fish products must be subject to a visual inspection during processing for the purpose of detecting and removing any visible parasite. Further, all fish that are to be consumed raw or almost raw must be subjected to a freezing process (-20(for at least 24 h in all parts of the fish). This also applies to fish products that are heated (e.g. hot smoked) to a temperature of less than 60°C. As far as salted fish is concerned, the process must be sufficient to destroy the larvae of nematodes. The US regulations stipulate that the freezing process to destroy parasites should be -20°C for 7 days or -35°C for 15 h (FDA, 2001a). Thus, the best prevention and control of anisakiasis is eating well-cooked or well-frozen fish only. A number of well-known fish products can be unsafe. This applies to all lightly preserved fish products (< 5% NaCl in water phase) such as cold smoked fish, gravad fish, matjes herring, lightly salted caviar, ceviche and several other local traditional products. A short period of freezing - either of the raw material or the final product - must be included in the processing as a mean to control parasites. This nematode has carnivores (dogs, cats, wild animals) as the natural definitive hosts. Gnathostoma is acquired by eating raw or under-cooked freshwater fish or by drinking contaminated water. Clinical manifestation of gnathomiasis is caused by migrating larval. The larval can reach 10 mm. Acute pain is experienced as the larval penetrate and migrate through abdominal and thoracic organs and eventually makes its way to the subcutaneous tissues causing swellings ("creeping eruption"). In serious cases the larval may reach the eye or central nervous system. These nematodes are of great public health importance although with restricted focus. Infection with C. phililppensis causes serious illness and usually leads to death if not treated in time. The adult parasite inhabits the intestinal tract, causing severe diarrhoea and death attributed to fluid loss. Eggs of the parasite are passed with faeces into soil or water, and the larval are found in intestines of freshwater fish having ingested embryonated eggs. The adult worm is most likely a parasite of piscivorous of birds with humans being accidental host. Angiostrongylus is a 25-30 mm long nematode having rats as the final host (Figure 5.11). 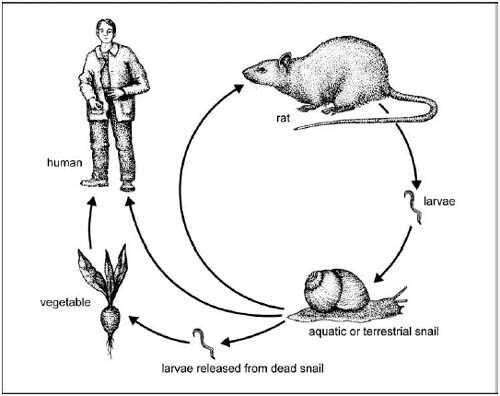 Figure 5.11 Life cycle of Angiostrongylus sp. Humans become infected by eating infected snails or molluscs. The worms migrate to the brain causing life-threatening meningo-encephalitis. The parasite was originally seen in certain parts of Asia, but parasitosis caused by this worm continues to be reported from new areas of the world. This could possibly be attributed to stow away rats. Diphyllobothrium are cestodes or tape worms. D. latum is the largest human tape worm and can reach more than 10 m in length. It resides in the small intestines of fish. Diphyllobothriasis is a long lasting infection (decades). Most infections are asymptomatic but manifestations may include abdominal discomfort, diarrhoea, vomiting and weight loss. The distribution of the tape worm is widespread in the temperate and sub-Arctic regions of the Northern Hemisphere where freshwater fish are eaten (Figure 5.12). Figure 5.12 Life cycle of the broad fish tapeworm, Diphyllobothrium sp. A recent mass occurrence of human infection with Diplogonoporus grandis, which is a cestode belonging to Diphyllobothridae, has been recorded in Japan (Kino et al., 2002). It was suggested that the transmission was due to consumption of raw, juvenile Japanese anchovies. The tapeworms recovered from patients had a mean length of 230 cm and a mean with of 9 mm. The life cycle of D. grandis has not been established. While more than 750 million people around the world are at risk for food-borne trematode infections (FBT), an estimated 40 million people are infected with one or more of these parasites (WHO, 1995). The majority of these infections (around 38 million) are fish-borne infections and are mainly occurring in some 20 countries where the parasites are endemic. Although seldom fatal, trematode diseases can cause morbidity and complications leading to death. The cause of infection is the ingestion of viable trematode metacercariae, which can be present in the flesh of, raw, inadequately cooked or minimally processed freshwater fish, molluscans and crabs. Infections are prevalent in several countries and among communities where eating raw, fermented or inadequately cooked fish is a cultural habit. To control a disease, it is important to know where it is endemic. In trematode disease it is also necessary to have a complete understanding of the biology of the parasite, the life cycle and each stage of the life cycle must be known from the egg via the miracidium to the cercaria to the metacercaria to the adult parasite. All hosts must be determined: the snail (first intermediate), the animal host or vegetation (second intermediate) upon which metacercaria may encyst. The adult worms are small, flat, slender and measures from a few up to 20 mm in length and 3-5 mm at the widest area. 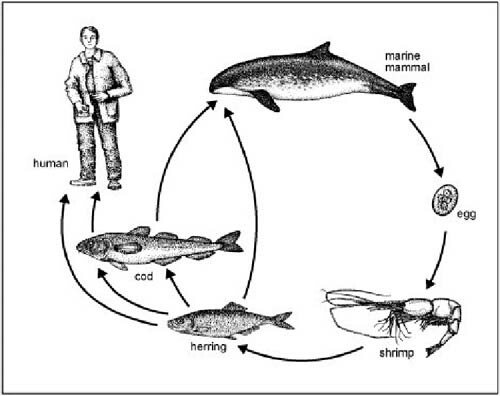 The general life cycle of trematodes, having fish as the second intermediate host is shown in Figure 5.13. Figure 5.13 Life cycles of trematodes having fish as an intermediate host (redrawn from Strauss 1996). These parasites are named as liver flukes due to their preference for migrating to the bile ducts and the liver. Small amounts of adult trematodes can be present without causing any disease or symptoms of disease. Large numbers of trematodes (up to 20 000 have been counted at autopsy of a patient) causes obstruction of bile ducts and possibly secondary bacterial infections followed by hepatitis. Also, the incidence of liver carcinoma is high in patients with liver flukes. The clinical symptoms are fever, epigastric pain, anorexia, diarrhoea, jaundice and abdominal pain. The adult lung fluke is located in the lungs of man and a number of domestic and wild animals (dogs, cats, pigs, tigers, leopards). The eggs from the parasite are passed into the bronchioles and expectorated from the body or swallowed and passed with the faeces. The first intermediate host is a snail and the second intermediate host is crustaceans or freshwater crab. Humans become infected by eating raw or undercooked crustaceans or crab. The immature worms will penetrate the intestinal tissue, enter the body cavity and penetrate the diaphragm into the pulmonary cavity and the lungs. The pathology associated with lung flukes depends on the number of worms ingested. A few worms are harmless, but large numbers cause chronic pulmonary disease. A complicating factor is the tendency of lung worms to enter the central nervous system (CNS). Invasion of the brain may result in mental disorder and meningitis. The clinical symptoms may be diarrhoea and abdominal pain. Once the worms are established in the lungs, there might be general malaise and cough. In severe cases, and when other organs are involved, the outcome of infection may be fatal. In recent years various species of fish-borne intestinal trematodes have gained epidemiological significance. An estimated 1.3 million people suffer from metagonimiasis, heterophyasis and echinostomiasis caused by approximately 70 species of intestinal flukes of which the Heterophyidae and Echinostomatidae are the main families. The two most important species are Metagonimus yokagawai and Heterophyes heterophies. They are very small flukes (1-2 mm) living in the intestines of the final host, causing inflammation, symptoms of diarrhoea and abdominal pain. The primary intermediate hosts are snails. Freshwater fish act as the second intermediate host for the metacercarial stage of Metagonimus sp. and brackish water fish for the Heterophyes sp. ; while brackish water bivalves, molluscs and oysters serves as secondary intermediate hosts to a range of other species of intestinal flukes (Chai and Lee, 2002). Raw or improperly cooked freshwater-, brackish water fish and bivalves including oysters are the major sources of infections. Clinical symptoms differ depending on the parasites involved and include acute abdominal pain, diarrhoea, lethargy, weight loss, fever and malabsorption. In some cases, eggs of the parasite mature deep in the intestinal tissues and may enter the circulatory system and cause cardiac damage. Light infections are asymptomatic. Fish-borne trematode infections are a major public health problem that has largely gone unrecognised by the health sector and the fish inspection services in recent years. All parasites of concern are transmitted to man by eating raw or uncooked fish products. Transmission of fish-borne trematodes is associated with behavioural patterns determined by socio-economic and cultural conditions in endemic areas. Consumption of trematode-borne fish and shellfish occurs most often around lakes, streams and ponds. Korean men will eat raw fish while drinking sake at social gatherings acquiring clonorchiasis. In South China people like to eat congee (rice gruel) with slices of raw fish. In Hong Kong freshwater fish is imported from the mainland and therefore expensive resulting in the more affluent groups acquiring clonorchiasis and possibility cholangiocarcinoma. Paragonimiasis is acquired by eating wine soaked "drunken" crabs in parts of China and in Thailand and the Philippines crab juice is used for medicinal purposes as well as using it in food preparations. Opisthorchiasis is acquired in Thailand by eating raw fish salads or low-salt fermented fish. Echinostome infections are from eating snails and raw fish in Northern Luzon in the Philippines and in Korea. Eating habits are deeply rooted in a culture and are resistant to changes. In some cultures raw animals and plants are eaten for medicinal as well as nutritional purposes. Raw crayfish is used to treat measles and transmits paragonimiasis. In the Cameroon, raw crab is thought to increase fertility and in Ecuador macerated crab supernatant is given to sick children. Raw foods are often eaten out of necessity because of the lack of cooking fuel. The use of human and animal faeces (night soil) for fertiliser and indiscriminate defecation contaminates the environment and water bodies. In some areas toilets are built over fishponds, thereby perpetuating the infectious cycle in rural aquaculture. The relative contributions of farmed fish and wild caught fish to the burden of these diseases are yet unclear. In countries such as China and Vietnam, aquaculture fish in small traditional ponds are heavily infected with C. sisensis and play an important role in the spread of the disease. Although there are effective drugs for treatment of most fish-borne trematode disease, it is more important to prevent infections. Control of trematode infections is difficult and the measures that have been employed have not been successful. The parasites involved in FBT infections have complex life cycles involving one or two intermediate hosts. Effective control strategies are therefore difficult to implement. The WHO Technical Report on trematode infections (WHO, 1995) details the basis of strategies for the control of fish-borne trematode infections. Many sectors are important and collaboration between all of them is necessary: i.e. public health, agriculture, aquaculture, food industry, food control and education. Methods for controlling food-borne trematodes in freshwater fish have shown promising results in countries like Korea and Thailand. These involve case detection and treatment, health education, improved sanitation, legislation of food safety measures and management of human faeces. Application of preventive approaches based on HACCP (Hazard Analysis and Critical Control Points) could also contribute to provide a high degree of food safety. Control of snail populations could also be envisaged together with the promotion of infestation resistant fish species for aquaculture purpose in endemic areas. So far very little have been done to control the infections in the food, i.e. the fish products. Most preservative parameters (temperature, pH, salt) used in processing fish, shellfish and aquatic animals have been only the subject of limited studies for their potential to control trematodes (Table 5.24). Heat inactivation of parasites is an effective method for eliminating the risk of parasitic infections. (Adams et al., 1997). The only data available for trematodes would seem to indicate a higher heat resistance of trematodes compared to nematodes. For nematodes, a recommended min of 63°C for 15 sec should be enough to inactivate the parasites (FDA, 2001a). Obviously, more work should be undertaken to gain a better knowledge of the necessary heat treatment needed to inactivate trematodes in the fish. Freezing provides an effective mean of inactivating parasites in raw fish. Again, for nematodes, 15 h at -35°C or 7 days at -20°C will be effective (FDA, 2001a) while data on trematodes (Fan 1998) indicates that 7 days at -20°C had no inhibitory effect on the viability of metacercariae of C. sinensis in naturally infected fish. Based on the work of Fattakhov (1989), the Ministry of Health of the USSR recommended in 1990, holding fish at -28°C for 32 h or at -40°C for 7h to inactivate the trematode O. felinus in fish (Table 5.24). Storage at refrigeration temperatures does not seem to affect trematodes. O. vevirrini was virtually unaffected when stored in saline solution at 4°C for 5 weeks (Sithithaworn et al., 1991). The large differences observed in the experiments reported in Table 5.24 reflect the differences in the methodology applied and in the way the viability of metacercariae are determined (visually or by artificial infection in laboratory animals). Table 5.24 Preservative parameters necessary to inactivate trematodes. Adapted from WHO (1995). C. sinensis in naturally infected fish. Recommendation, Ministry of Health, USSR, 1990. 3. 7 days at -20°C had no inhibitory effect on 10 rats infected but 3 days storage at -20C, followed by thawing and re-freezing for 4 days had 100% inhibitory effect on 10 infected rats. A large number (nearly 40) of parasitic protozoans are known to be infectious to humans. The most important of those being transmitted primarily via water are shown in Table 5.25. Table 5.25 Protozoans transmitted via water. All of these protozoan parasites are excreted in the faeces of the host. The protozoan can enter water and be transmitted directly by drinking the water or indirectly via contaminations of food, utensils, hands of food handlers or flies and other pests. Direct person to person contact is also possible as no intermediate host is required for protozoan parasites. Infections can range from asymptomatic or mild bowel discomfort to diarrhoea or dysentery with or without blood in the stools and can last several months (amoebiasis). Cryptosporiasis often begins with an influenza-like illness and with possible development of diarrhoea, abdominal pain, nausea, vomiting and fever. Infections with Giardia can range from asymptomatic to fatal following months with severe symptoms of discomfort in the upper intestines. The important steps in preventing protozoan infections are good personal hygiene, proper sanitation of toilet seats, avoid eating raw fruit and vegetables and treatment of drinking water. Slow sand filtration combined with chemical flocculation has been recommended as the best method (Fayer 2001). A review of water purification methods has been given by Ives (1990).